IRELAND HAS A comparatively high minimum wage in terms of money paid. However, the cost of living in Ireland is also relatively high, so any gain in wages is offset by paying more for goods and services. But in Ireland, what does the minimum wage mean and how does it compare to the rest of Europe? The average monthly minimum wage in the EU puts Ireland near the top. However, as has been discussed, the cost of living is higher, so do Irish minimum wage workers have less of a purchasing power? This chart compares gross minimum wages taking into account differences in price levels by applying purchasing power parities (PPPs). As might be expected, adjusting for differences in price levels reduces the variation between countries. It does show that despite making more money in pay terms, the 83,000 people estimated to be on the minimum wage of €8.65 an hour, their purchasing power is broadly similar to much of Europe. Added to this, Irish minimum wage workers earn on average just over 40% of the average wage. While purchasing power as an abstract can be difficult to understand, here’s what a person on minimum wage in Ireland can buy with their wages. This is presuming that a single person with no children and no debts works one minimum wage job for 39 hours a week, paid for 52 weeks of the year, earning €17,542 before tax and USC. After tax, that is €16,960 or €1,413 a month. Rent: Many financial advisers suggest a 40% rent to income threshold. That means a person on minimum wage in Ireland can afford to spend €7,200 a year on rent. That works out at €600 a month. If you want to live alone in Dublin for that money, be ready to see the word “studio” a lot. According to the AA, the average cost of running a car in Ireland is €10,751 a year. That represents a massive chunk of the minimum wage. If a person on minimum wage in Dublin decides to use public transport, cash fares on Dublin Bus to and from the city centre from outlying suburbs (Blanchardstown, Swords, Clondalkin, Dun Laoghaire) would cost €6.60 a day. The Luas and train systems cost slightly less, but all of those fares can be cut by using a Leap Card. For someone in the capital, a Leap Card to and from a suburb would cost around €1,250 a year, presuming they got the bus twice every work day for 48 weeks of a year. After rent and travel, there is €713 left in the account. The next thing to take care of is food. The CSO national household budget survey suggests that the average spend on food for people on private rents is €108 per week, or around €432 per month. In many of the above examples, bin charges and heating are covered. That leaves electricity bills of around €25 a week, home phone and internet bills of €30 and TV costs of €10 a month. That leaves €141 a month, or €35 a week on discretionary or emergency items. So, while the stats say that Ireland has a comparatively high minimum wage, it really doesn’t go very far. 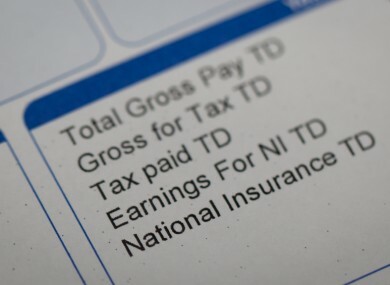 Read: How does the minimum wage (and the cost of living) in Ireland compare with Europe? Email “What can the minimum wage buy you in Ireland?”. Feedback on “What can the minimum wage buy you in Ireland?”.